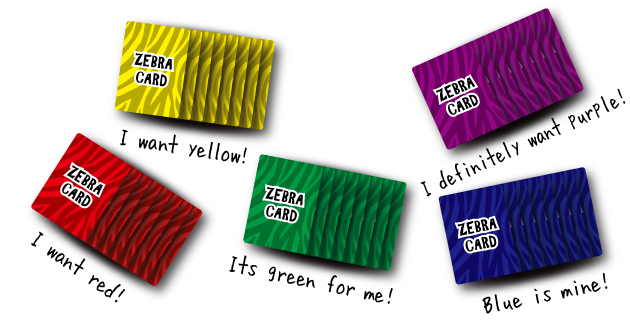 ・Deal ZEBRA cards (8) to each person with their favorite color, 1 color per person. 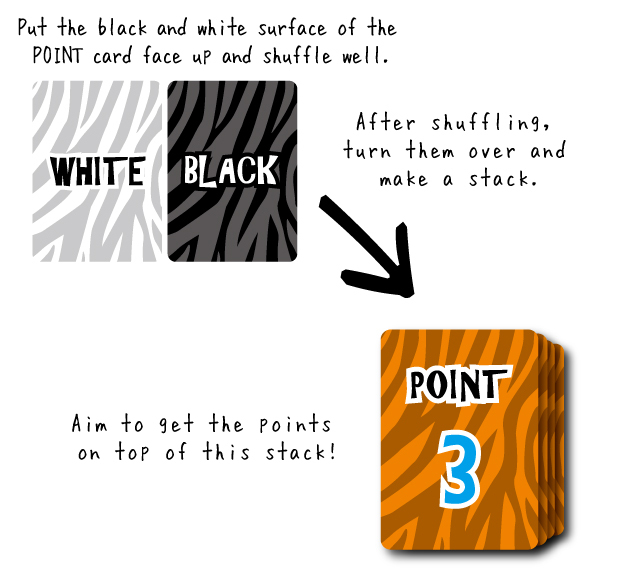 ・Deal 2 SPECIAL ZEBRA cards to each person after shuffling well. 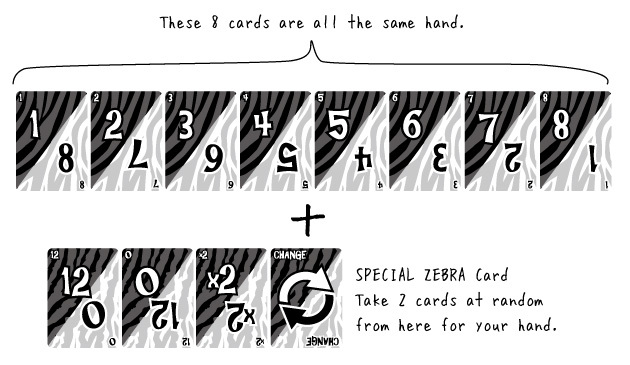 ・With 8 ZEBRA cards + 2 ZEBRA SPECIAL cards, your hand will have a total of 10 cards. ・After shuffling the POINT cards well with the surface on which BLACK, WHITE is written face up, place the deck with the POINT surface face up. 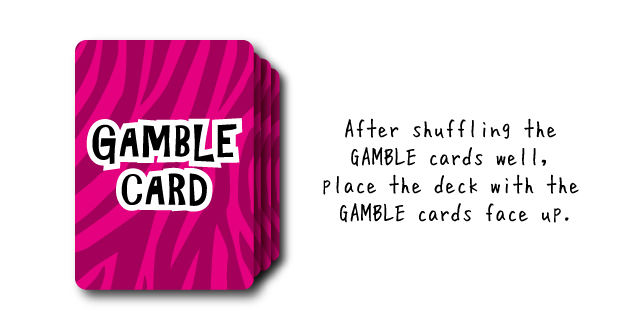 ・After shuffling the GAMBLE cards well, place the deck with the GAMBLE cards face up. ①Check the card on top of the POINT card deck. You will compete to get those points. 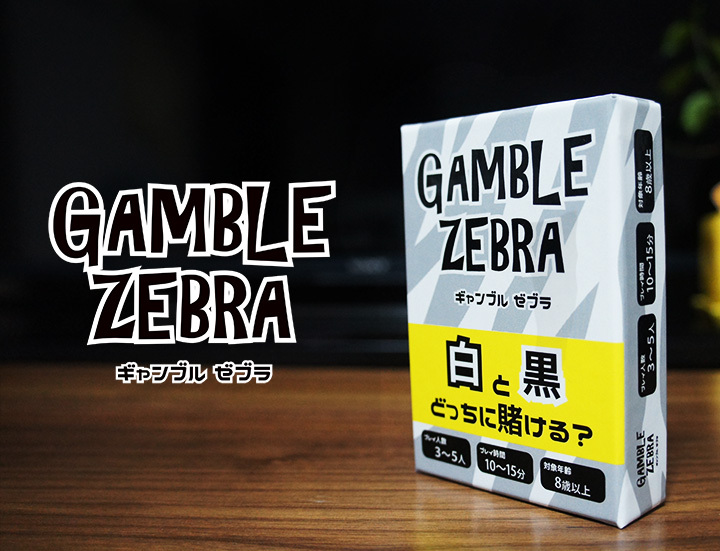 ②Once each player has decided which card they will produce, everybody shouts “Zebra!” together and produces their card. 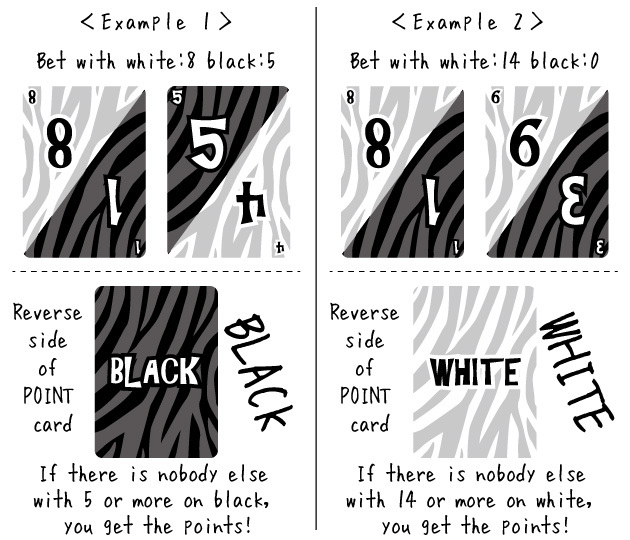 Choose which card to produce after guessing whether the reverse side of the POINT card is white or black. 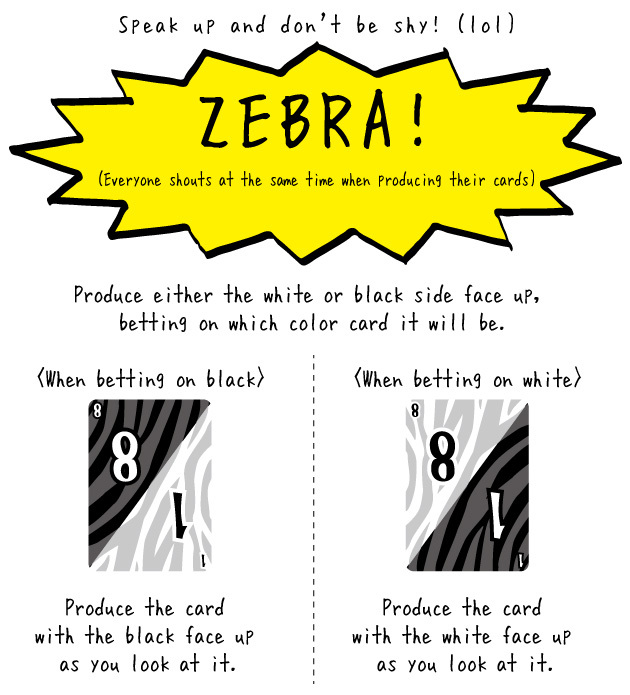 Produce either the white or black side face up, betting on which color card it will be. After you have produced the card, you cannot change the color. 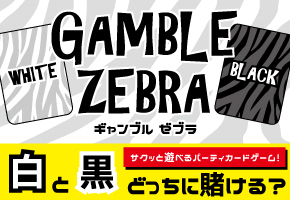 ③When, after looking at everything, you have decided what card to produce next, everybody shouts “Zebra!” together and produces their card. 1st time：The white 8, black 1 card is placed with white face up. ⇒Those producing white have bet 8. 2nd time：The white 4, black 5 is placed with black face up. ⇒Those producing black have bet 5. Compete based on white:8 and black:5. 2nd time：The white 6, black 4 card is placed with white face up. ⇒Those producing white have bet 6. Compete based on white 14: black:0. 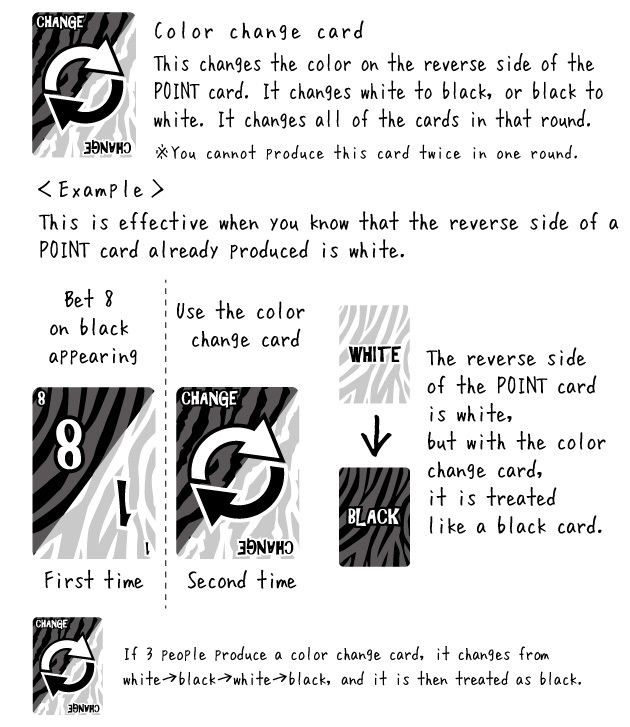 ④When everyone has produced 2 cards, turn over the top card on the POINT card deck and check whether it is white or black. 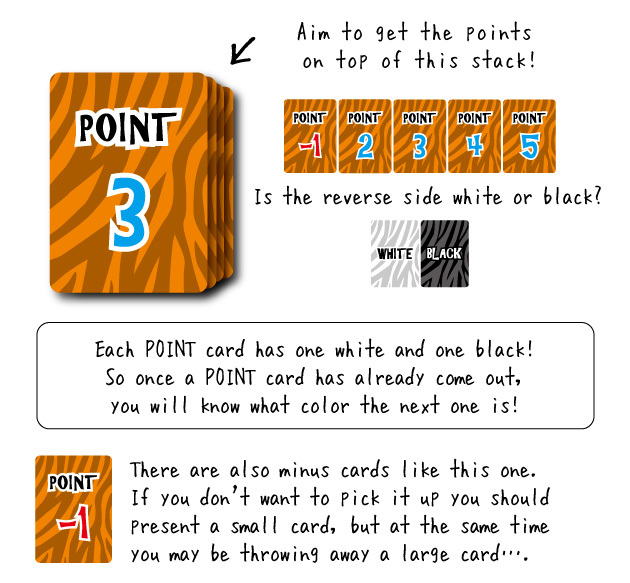 The person who has bet the highest number on the color that is on the reverse side of the POINT card will get that point card. Each person should make a disposal pile near them and throw away the 2 cards they produced on that pile. 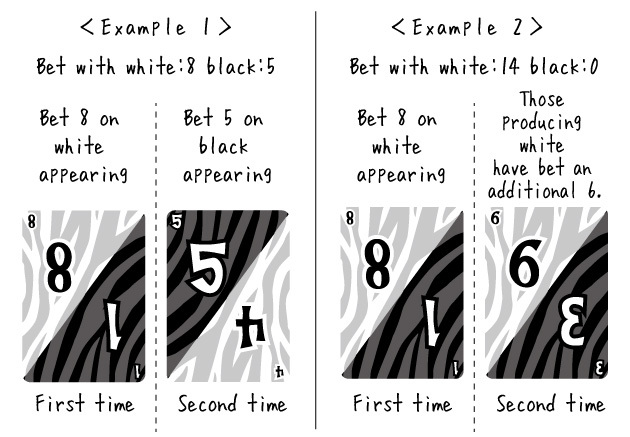 unless there is somebody who has bet on black with a number larger than 5, you will get the point card. in the same way, unless there is a person who has bet on white with more than white 14, you will get the POINT card. ⑤The person who gets the points, takes 1 card from the GAMBLE card pile. Your points will be the POINT card you got ＋the GAMBLE card. Lay down the POINT card you got + the GAMBLE card as a pair so everyone can see them. You get a 5 POINT card, and the GAMBLE card is -3. In this case, you get 2 points. You get a 2 POINT card, and the GAMBLE card was × 2 points. In this case, you get 4 points. You get a 2 POINT card, and the GAMBLE card is -3 points. In this case, you will get -1 point. 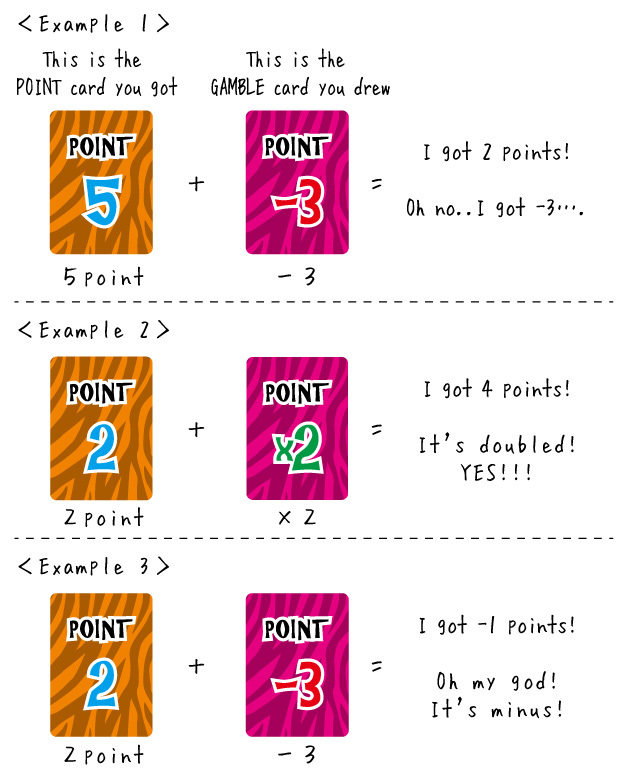 Repeat steps ①-⑤ for 5 rounds (until your hand runs out), and the one with the most points is the winner. As your hand starts with 10 cards, you can compete for 5 rounds. If you get bored of the normal rules, try these alternative rules. 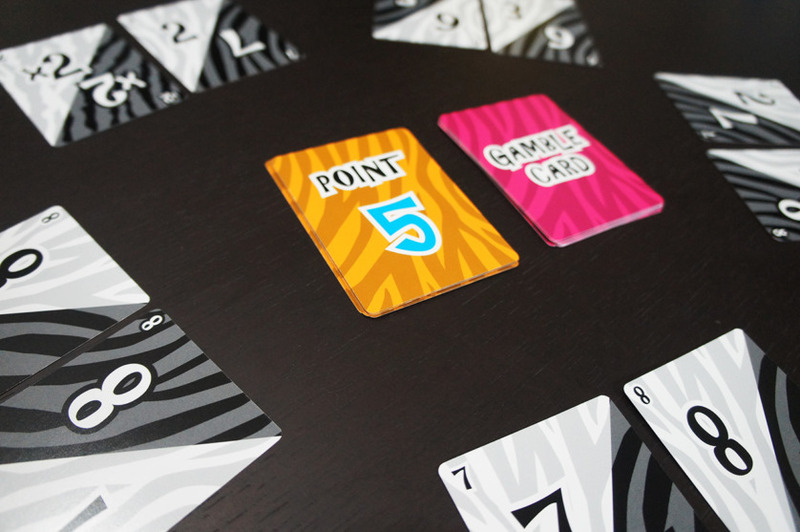 Play with the color side of the POINT card stack facing up. 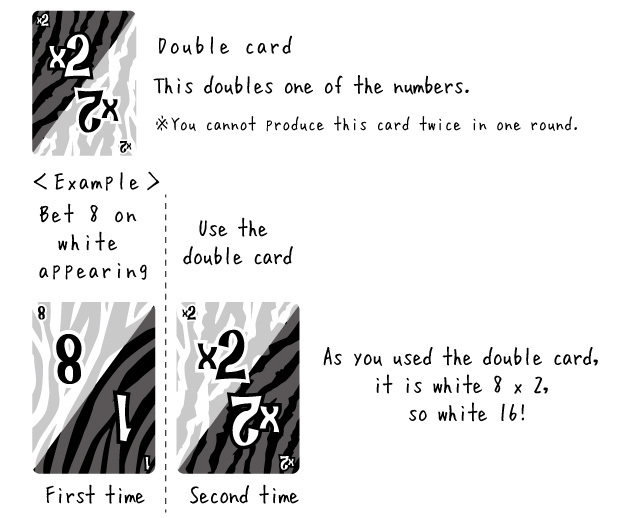 All other rules are the same as the normal rules, so for that color card, the person who produces the highest number gets the POINT card. 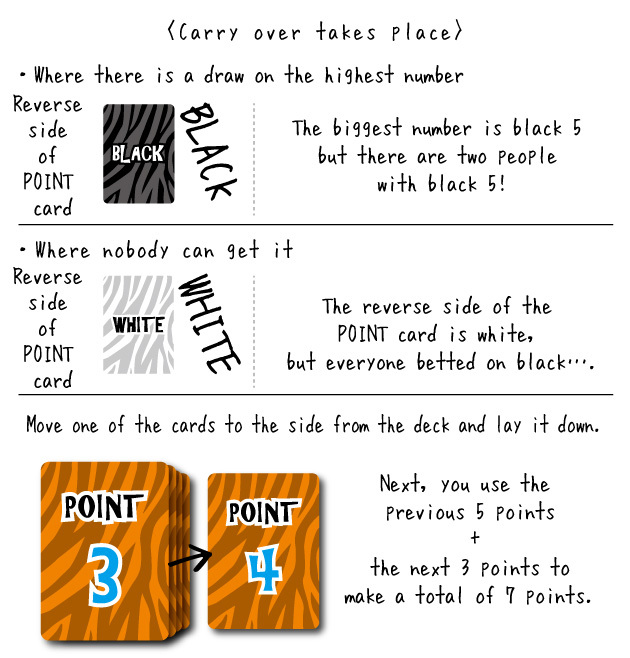 With these rules, you bet while knowing whether it is black or white but you do not know what number of points the card is you are betting on. After getting the POINT card, turn over the point card and confirm how many points the card was. This increases the gambling aspect. 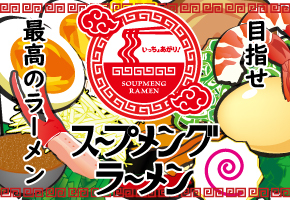 © Copyright 2019 SHUNROID BLOG. All rights reserved.